Race Car? Rally Car? Show Car? Family Car??? You Decide!!!! ??? ?500HP+ 2015 Evolution MR!! This Legendary Mitsubishi Evo X Has Over 20k In Modifications!!! And Is E85 ?? Fed Flex Fuel Tuned. Again This 2.0L All Wheel Drive 4 Door 4 Banger Is Making Over 500HP!!!? ?And Has Room To Seat Four ??????????? And Fit All The Groceries????????. With That Being Said You Should Be Ready To Purchase ?? But Of Course We Want You to Have All The Information So Here It Goes......This Monster Was Built And Tuned By The Evo/SST Guru's @ KOSMIC Motorsports!?? Race Built Sequential 6 Speed Dual Clutch Transmission With All Their Magic Tossed Into It! (This Evo Spools And Shifts Faster Than Alabama Weather!)???? MAP Exhaust Manifold Feeds A HUGE Garret Dual Ball Bearing GT3576R Turbo For "ALL THE BOOST" With Very Little Turbo Lag!!! ?? ETS Intercooler! ID 1300cc Injectors! AMS Downpipe! COBB Cat Back Exhaust That Sounds Amazing! Completely Upgraded Fuel System With A 450 Pump! Innovate Ethanol Content Guage! Mishimoto Automotive High Capacity Oil Cooler! ?? KillerGlass Radiator Hoses! New Seibon Carbon Hood! Lots Of? ?Well Spent On This ??! Only 40k Miles On This Beauty/Beast. Mods Were Done At 22k Miles. Reciepts Included!!! Factory Options Include Huge Brembo Brakes On All Four Corners, BBS 18" Wheels And A Thumping Rockford Fosgate Audio System! Love To Hurt Feelings??? For Just $31,450 You Can Own This Amazing Evo And Squash The Hearts Of Most Subaru And Mucle Car Owners!? ?.......Want A Ride That Commands Attention And Allows You To Truly Enjoy Driving? 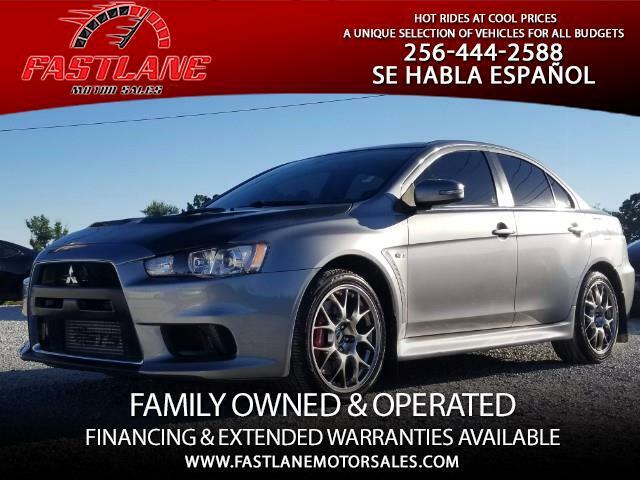 Come Over And Choose One Of Our Many "Boosted Beauties" And Ride Out In Style At Fast Lane Motor Sales! ? ?